JustWordz: Baby Boy here i come!! Baby Boy here i come!! 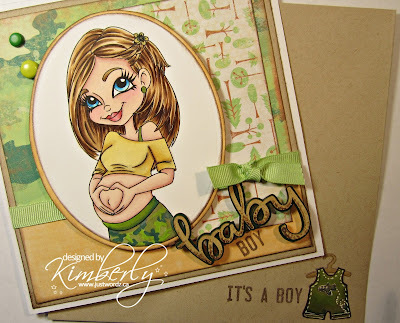 Baby Boy here i come..
Hey gang, i finally made it back to blog land. I have a super cute image from Redonkadoodles to share with you all. my new chipboard pieces i got from Make it Crafty..ohhh so perfect for this card. I've colored this up with promarkers and a few copics for the hair. I do have a video on this HERE. I used not so traditional paper as the request was for outdoorsy type of parents. envelopes came from The Paper Garden online in Canada. The chipboard comes in many sizes at great prices. This particular one is 2.25 and my card size is 5.5 x 5.5. They are easy to color with your markers and i added some glitter of course with glitter gel pens. I loved how it came out and i hope to stamp a little cleaner on the envelope for future mail outs. I just love the idea of adding to the envelope. Many thanks for dropping by and hope to get back on track with blogging..
Take care and keep warm this winter.